Twenty years before Wisconsin became a state, the discovery of vast lead deposits brought a population boom to this area. 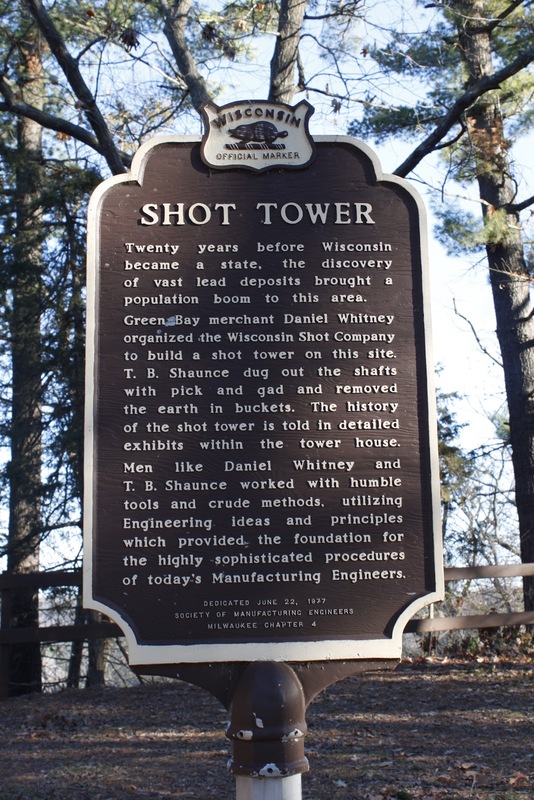 Green Bay merchant Daniel Whitney organized the Wisconsin Shot Company to build a shot tower on this site. T.B. Shaunce dug out the shafts with pick and gad and removed the earth in buckets. The history of the shot tower is told in detailed exhibits within the tower house. Men like Daniel Whitney and T.B. Shaunce worked with humble tools and crude methods, utilizing Engineering ideas and principles which provided the highly sophisticated procedures of today's Manufacturing Engineers. The marker is located inside Tower Hill State Park on westbound County Highway C, two miles west of its intersection with U.S. 15, 5808 County Road C, Spring Green, Wisconsin 53588. 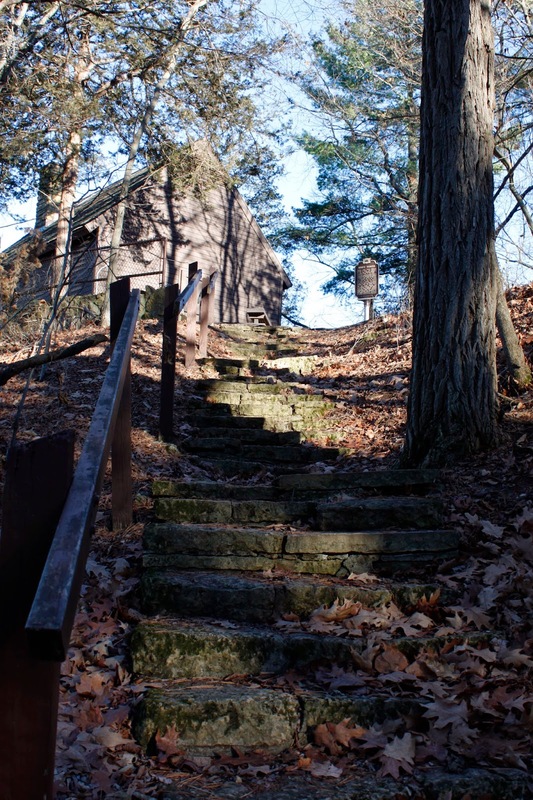 Tower Hill State Park comprises 77-acres of heavily wooded property alongside the Wisconsin River. It takes its name from the mining of lead and production of lead shot on the property in the 1800s. Visitors to the park can tour the restored Helena Shot Tower and melting house. Shot towers were used to drop molten lead 75+ feet into a basin of cooling water. During the free-fall, the lead became spherical. After cooling the shot was sorted by size and could be further fashioned as necessary. The park was closed for the season when we arrived, but the ranger station was open and we were permitted to park in the parking lot and hike up to the marker (nice!!). The ranger described the hike as "one that will get your heart pumping." That was an understatement! 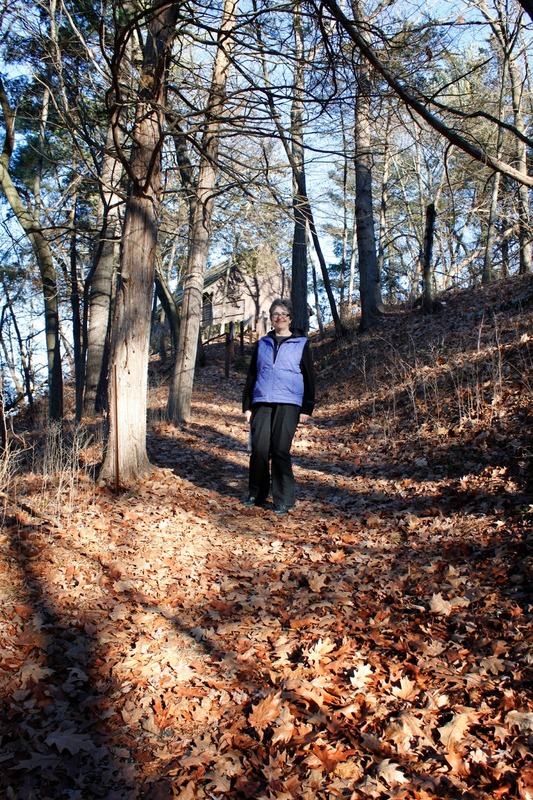 The hike is at about a 75-degree incline to the location of the marker atop Tower Hill, but well worth it. There is also bench about half-way up the hill, for those needing to take a breather. Use the Tower Hill State Park label below to identify all markers at this location. This is a very steep climb, not for the faint of heart! The view of the Wisconsin River from Shot Tower . . . It's very steep coming down as well . . .
Map of Tower Hill State Park. Is it a mile and 1/2 from parking to the tower? I couldn't say for sure about the distance. Since we arrived in winter and the park was closed to vehicle traffic, we had to park at the ranger station and hike in. It seems to me there is a parking lot at the base of Shot Tower Hill, which would make access much easier when the park is open. It's the hill that's a challenge, but well worth the effort.